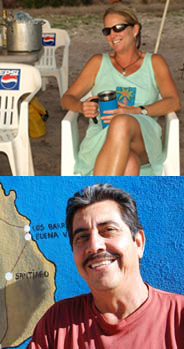 Ricardo, a La Paz native, and Mary, a seasoned Baja guide since 1983, began running sea kayaking and whale watching trips out of La Paz in 1993 and thus Mar Y Aventuras (Sea & Adventures) was created. It had been a dream of theirs from the onset to build tastefully decorated yet modestly priced guest rooms for their adventure trip clientele needing accommodations in La Paz before and after their camping adventures to the islands. In 2000 their dream of the hotel Posada LunaSol was realized with the first 9 guest rooms built on the second floor above the Mar Y Aventuras office and warehouse. Built in the same safe and quiet neighborhood where Ricardo grew up, the hotel's convenient location (only 3 blocks from the waterfront boardwalk) and charming atmosphere has attracted more than just sea kayaking clientele over the years. The small hotel has grown to 20 rooms on 3 floors with a pool and cafe yet maintains its quaint and cozy atmosphere where you'll find friendly faces to greet you upon arrival. Ricardo, who lives only a few blocks from the hotel, and Mary, who now runs the US-based sales office in Bozeman, MT, share a deep love and admiration for La Paz and Baja, especially the surrounding natural areas of outlying islands and remote beaches. Born in Mexico City, raised in Jalisco and having studied at the University in La Paz, Patricia joins the Posada LunaSol and Mar Y Aventuras team with a great deal of knowledge and expertise. 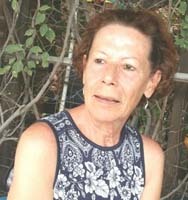 After living and studying at the University in La Paz for 20 years she moved to Loreto and took her first job in hotel reception. She immediately enjoyed working with tourists, going the extra mile to help them create a wonderful vacation came easy to her. 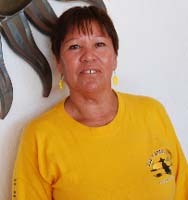 She enjoyed 8 years of working in the hotel business in Loreto before returning to La Paz. She’s spent the last couple years studying subjects she’s passionate about like psychology and alternative medicine while keeping fit and practicing yoga. We welcome Patricia with her organized and helpful manner as our evening receptionist at our hotel, Posada LunaSol and Mar Y Aventuras. Maribel is our long time housekeeper having started cleaning the office of our sea kayak business of Mar Y Aventuras in 2000. A year later we completed the first 5 rooms of Posada LunaSol and she become our housekeeper. Maribel is often heard singing as she maintains and takes pride in a squeaky clean Posada LunaSol. We are thrilled with Abraham’s return to the helm of the Mar Y Aventuras office team! Having worked for us in this same position 20 years ago he understands well the Mar Y Aventuras commitment to expert client services. 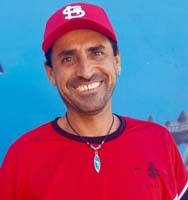 Abraham came to La Paz from Mexico City in 1991 to study marine biology. His studies included research on sea lions and the endangered vaquita (small endemic porpoise in the northern Gulf of California). 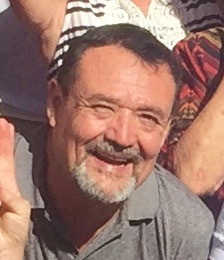 With a degree in marine biology he began working as a guide for Mar y Aventuras in 1996 on sea kayaking and gray whale expeditions. In 1999 he changed positions and became our client services manager. Abraham later left Mar Y Aventuras to pursue running his own company and now continues to operate an environmental consulting business in conjunction with his client services position at Mar Y Aventuras. Abraham’s expertise, friendly demeanor, and organizational skills are the perfect fit for this position on the Mar Y Aventuras team in La Paz! © 2019 Posada LunaSol. All Rights Reserved.